East Coast Firewood, LLC is NOT your average, “run-of-the-mill” firewood supplier. We are forest resources experts, consisting of registered foresters, raw material procurement specialist and community-minded business professionals. Affiliated with Hunt Forest Resources, LLC, which is a timber management and wood products dealership, East Coast Firewood possesses the knowledge, experience and dedication to deliver only the finest quality firewood products to our customers while preserving the long-term sustainability of healthy forests. East Coast Firewood is engaged in every aspect of the wood products business and therefore ensures the highest level of quality control throughout each step of the supply chain. Our dedicated and passionate team strive each day to live up to our motto: Exceptional is the Expectation. While we are proud to be a central North Carolina business, associated with the “Got to Be NC” agriculture coalition and North Carolina Forestry Association, our premium USDA certified kiln-dried hardwood firewood products far exceed all State and National regulation requirements and are certified to be pest and mold-spore free, therefore our kiln dried products can legally and ethically be transported across all state lines and into all State and National parks/campgrounds. We can, and do, ship kiln-dried firewood all over the southeastern United States. While we are always available to answer any questions or alleviate any concerns, below we have provided some general insights regarding firewood that may assist you in making the best decisions for your needs. Regardless how big or small your firewood needs, we look forward to earning and maintaining your business for years to come. Check out the FAQs below and feel free to contact us if you have more questions. The word "firewood" is simply a generic term to mean any woody material used as a burning fuel. However, the firewood that we at East Coast Firewood provide, meets specific criteria to ensure the most efficient and cleanest burning product available. We sell "green", naturally seasoned and kiln-dried firewood. Although we typically "age" our wood in log form for several months, when the logs are initially split the firewood is considered "green", which means it has a higher moisture content than seasoned or kiln-dried firewood and is typically not ready to burn as efficiently as dryer products. "Green" wood can sometimes have a moisture content of 40-60%. Utilizing a patented 16-way splitting head our firewood is consistently cut to uniform sizes, typically 4"x4" pieces that are 16" long. Once split our seasoned firewood generally takes between 6-10 months, under normal outdoor conditions, to achieve the optimal moisture content of around 18-25%. While many people have suggestions or recommendations as to what moisture content is the best for burning it truly depends on your application and often even your particular burning apparatus. A “cord” of wood is a measure of volume that is equal to 128 cubic feet. This means that utilizing the typical 16" long firewood pieces, the wood, in stacked form, will measure 4 feet tall by 8 feet long (across) by 4 feet deep. While there may be some generalized average weights for a cord of firewood, the cord measurement is cubic feet volume measurement and does not equate to a weight measurement. The weight will vary greatly depending on wood species, moisture content of the wood, etc. Note: Be aware that many firewood sellers typically sell "face cords" (also known as "ricks") of firewood, which is equal to 1/3rd of a full cord. Basically, instead of being 3 rows deep of firewood, sellers will just sell the one row (1/3rd), but will sometimes fail to inform the customer that they are not actually selling a full cord of wood, but rather a "face cord". If firewood is sold from the back of a standard pick up truck it is most likely a "face cord" and definitely not a full cord of firewood. Seasoned firewood should be stored off the ground and away from the walls of a building to allow air to flow around the wood. The top of the stack should be loosely covered to prevent it from getting soaking wet or icing over. Covering firewood with a tarp or stacking it under a lean-to should be sufficient. You can store firewood in a shed or basement, but you may be inviting insects and rodents into your living space. Being in an enclosed area will also slow down any drying that the wood may need to do. If you purchase kiln-dried firewood, you can store it inside your home. Seasoning wood is as simple as stacking your freshly split green wood and letting the sun and wind do the rest. Wood should be stacked evenly, off the ground, with both ends of the split logs exposed to air. The stacks of wood should not be tucked against a building or put into a shed or basement, unless weather (lots of rain or exceptionally high humidity) makes the outdoor conditions poor for drying wood. While the wood is drying, it’ll smell like sap or sawdust. That “freshly cut wood” smell will dissipate during the drying process. While the wood is seasoning, it should not be covered by tarps or plastic. You need air to circulate around the pieces of firewood for it to dry properly. Once dry, you can loosely cover the top third of the stack with a tarp, but leave the majority of the wood uncovered so it can continue to dry without molding. The time required to season wood is largely dependent upon type of wood, weather conditions, and airflow. Being in an enclosed area will lengthen the drying process. In some dry areas, seasoning wood may take only a few months, and in others, over a year. Soft woods, such as pines, take less time to season than hardwoods, like oaks. Hardwoods should be gathered during the winter when the sap levels are lowest, for the shortest drying times. Soft woods can be gathered in the late spring or early summer and the upcoming warm weather can be used to dry the wood properly. There are a few ways to test if your wood is ready for burning. You can buy a moisture meter with a pin that you press into the wood and it will read out the moisture level (20% is optimal). Other options include knocking two pieces together and listening to the sound it makes. If there’s a heavy “thud” your firewood is still wet and needs to dry more; if there’s more of a “ring” sound, it’s probably ready to use. The ends of your firewood should have visible cracks in them as the moisture has evaporated out and the wood has begun to split. You could also try to burn a piece. Get a fire going and try to light a new piece. If three of the sides are lit within 15 minutes and it’s not overly smoky, your wood is ready to use. You do not want to frustrate yourself with trying to light wet firewood. Trying to burn just any type of wood will not be easy due to the fact that the wood will naturally hold moisture. Seasoned firewood is much easier or burning. However, a downside to seasoned firewood is that it can take several months until it is fully dried, or "seasoned." A faster an better-burning alternative is kiln-dried firewood. Kiln-dried firewood will be heated to optimal burning performance, so it will have less moisture and be ready for use long before seasoned firewood. 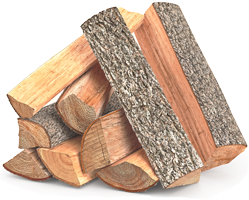 To add to the benefits, certified kiln-dried firewood will be stamped with a USDA certification and will be free of all insect pests and mold spores. While you can buy firewood locally at big box stores, you’ll likely pay more due to the increased packing and shipping costs incurred by moving the wood long distances. Find a local company that sells kiln-dried firewood and is certified by a state Department of Agriculture or federally by the USDA. These certifications mean the wood has been treated in a way that prevents the spread of insects and harmful plant diseases across the country. A great campfire doesn’t need to be difficult. A basic “Teepee” style will often do the trick to get your fire going. Start by placing your tinder pile in the center of your campfire spot. Dryer lint, newspaper, dry bark, pine needles or dry grass are all good tinder. Around your tinder pile, start leaning some thinly split pieces of wood, called “kindling,” together in a circle with the tops all leaning on each other so they stand upright on their own. Keep adding kindling in ever increasing sizes outward until you’re using twigs that are about a quarter- to half-inch thick. Once your kindling is stacked, add your fuel wood to the outer circle, starting with three or so logs. Use a match and light your kindling. The fire will rise upward as the ever increasing size of fuel wood catches. Eventually, the Teepee will collapse and you can just add logs to the fire from there. If your properly stacked firewood got wet in a rain or snowstorm, it should only take a few hours or possibly a day or two to be completely dry again, in the right conditions. Placing wet wood near your wood furnace is a great way to ensure your firewood dries out as quickly as possible, and the normally dry air surrounding a stove or furnace would likely benefit from the addition of some damp logs. If you don’t need the wood in the next couple days, you can leave the wood in its outdoor storage and it’ll dry over the next week or two, naturally, in the sunshine as air circulates around the damp logs. If your firewood is wet because it’s still green, click here to read about properly seasoning firewood. Wood that has been stored outside and has not been kiln-dried, is a great home for many insects. By stacking wood like this inside or directly against your home, you’re inviting those insects to take up residence with you. Termites, cockroaches, ants, beetles, and spiders are all common hitchhikers on firewood. Where there are insects, there are often rodents and where there are rodents there are often snakes. If you don’t want these animals in or near your home, you’ll need to find a suitable place to stack your firewood that is accessible, but far enough away from your home that they stay outside. The Goodness Grows in NC program was formed in 1985 to provide the North Carolina Department of Agriculture and Consumer Services a means to market awareness of agricultural products to the residents of North Carolina. The program encourages the production and sale of local goods. The Goodness Grows in NC program is a symbol of the highest quality agricultural products in North Carolina. East Coast Firewood is proud to be a member of Goodness Grows in NC and provide quality, kiln-dried firewood.